Spider-Man is about to get some kind of noir / stealth suit in the upcoming Spider-Man: Far From Home and we now know how that looks like. A redditor leaked the costume in full, supposedly from the Brazilian Comic Con where the second trailer for Far From Home is also set to arrive this Saturday. Have a look at the costume below. 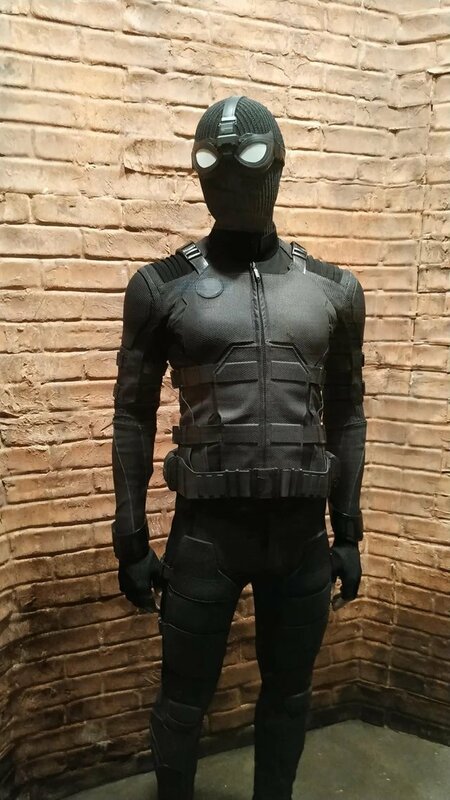 The suit has a tactical feel to it and looks like it could’ve been provided to him by S.H.I.E.L.D.. There’s even a spot for the badge atop his chest which has been conveniently removed, potentially to avoid spoilers. It certainly blends in with ongoing theories that Peter Parker is working undercover in some fashion for Nick Fury and Maria Hill who are pretty much the frontrunners for S.H.I.E.L.D.. The fact that the post was removed from Reddit adds further credence to its authenticity. This is a busy week for Marvel and things should get really interesting today onward with the unveiling of first gameplay footage from The Avengers project. This should be followed by the arrival of the Avengers 4 and Spider-Man: Far From Home trailers, although none are officially confirmed at this point. Stay tuned to Appocalypse as this week looks set to be packed to the brim. Spider-Man: Far From Home﻿ releases worldwide on July 5, 2019.